Before we even had time to lament Toscano & Sons’ departure, lo and behold: Tuscany at Your Table swooped in to the rescue! 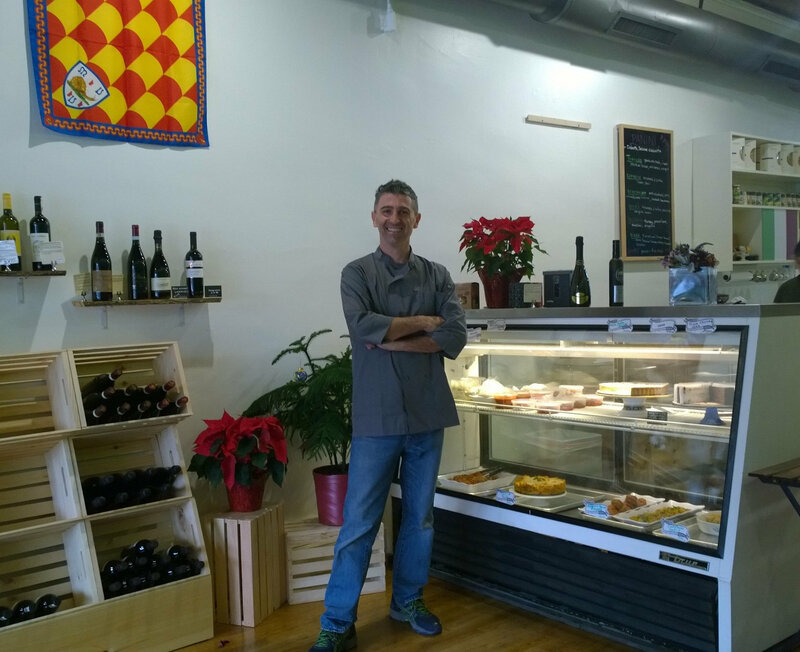 It’s worth dropping by just to meet the delightful chef Luigi (pictured) and his wife Meredith D’Arienzo, but before long, you’ll notice the aroma of whatever special of the day Luigi has prepared for us. When I visited, it was delicious, piping hot meatballs and spaghetti. I was sorry to have missed lasagna the day before, but grabbed up the last few servings later in the week. If panini’s are what make your taste buds water, you’ll be able choose from a variety of them each day. In addition to the familiar pizza dough, there’s freshly-made pasta and various dry goods. There’s also a nice selection of Italian wines. Looking for something new to do in the neighborhood–how about taking a cooking class? Small groups of about 8 people will prepare three dishes together then enjoy the fruits of your labor. More details can be found on their website here. Here’s a sample of the cooking-class schedule. As you can see, the classes fill up early, so don’t hesitate when you see one you want to attend! Email meredith@tuscanyatyourtable.com to sign-up for a class. Please stop by and welcome Luigi and Meredith to the neighborhood–your taste buds will thank you!